Gucci Flora Gracious Tuberose will make you feel beautiful and attractive. Gucci Flora Gracious Tuberose EDT 100ml. is a new bloom from Gucci. The Flora Garden Collection takes three blooms from the historic print and creates a bouquet of discerning eau de toilettes in their honour. Gracious Tuberose is a classical homage to the flower’s innocent nature and luscious petals. Serenely beautiful, the brush of violet leaf top notes lingers into the tuberose heart, before leaving a base of cistus and white cedarwood. Top notes: violet leaves and peach. Heart notes: tuberose, orange flower and rose. Base notes: cistus (Rock Rose) and white cedarwood. Eau de toilette, 100ml. Regrettably, this product is non-returnable and non-exportable. 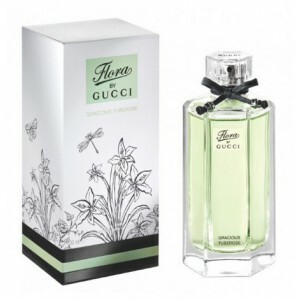 Gucci Flora by Gucci Gracious Tuberose is a new very fresh, released in 2012. It is based on floral tones which gradually disperses. In the first instance you will be faced by citrus notes, for then, easy to pass the tones floral and sensual essences of wood in central notes. Gucci Flora by Gucci Gracious Tuberose fragrance is suitable for hot summer days, although it has a cool composition, which is definitely unusual. It is appreciated especially active women, who love the free time to develop sports. However, the fragrance Gucci by Gucci Flora Gracious Tuberose is suitable for any occasion. At work you will revive your mind and body so that you will be able to successfully accomplish your daily tasks. According also to a romatic dinner when you will make you feel beautiful and attractive. This universal scent, Gucci by Gucci Flora Gracious Tuberose, is simply the perfect choice that will not disappoint you again!